AVONDALE — Chicago's beloved hot dog spot, Hot Doug's, is closing permanently on Oct. 3, owner Doug Sohn confirmed Tuesday. After posting a message about a "permanent vacation" on the Hot Doug's website, Sohn told DNAinfo Chicago, "It's time to do something else" and that the restaurant would close "for good" in October. "For me it's time," Sohn said. "There really is no overwhelming reason other than it's time to go do something else. ... The plan is not to own a restaurant anymore." In a tweet Tuesday, Hot Doug's said "we thank you for your support & suggest you don’t get a Hot Doug's tattoo any time soon." Sohn said he had "no idea" what he would do next. Senior Editor Justin Breen shares his insight into why Chicagoans are so upset that Hot Doug's is closing. "I haven't thought the plan completely through ... maybe interpretive dance," he said with a laugh. "I wonder if I'm too old for that. I don't totally know yet." 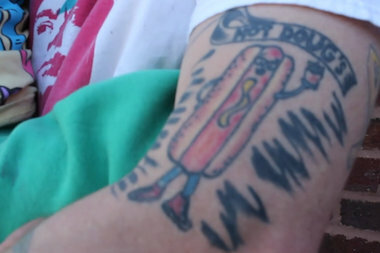 Though he said he would "never rule out" a possible Hot Doug's return, Sohn said people should get their dogs while they can. "I'm calling it," Sohn said. "I'm not making the hot dogs $11 yet, so don't worry." He opened the original Hot Doug's in Roscoe Village in 2001. After that location closed due to a fire in 2004, it moved to its current location on California Avenue. The restaurant rose to national fame, often in the form of television appearances such as the Travel Channel's "Anthony Bourdain: No Reservations." Sohn said he has thought about his fans freaking out over Tuesday's news. "It's possible. That definitely ran through my head," he said. "Like I said, I considered the possibility, and I'm as well curious to see what happens." As for the last day, don't expect a big farewell bash. "We'll do it the way it's been since we started," Sohn said. "I don't see any reason to deviate." Fans said they were shocked and disappointed. Outside the restaurant Tuesday morning, Jessica Larosh, of Lincoln Park, and Tyler Plantan, who is visiting from Minnesota, lined up to get a taste of Hot Doug's menu. "It's sad," Larosh, 27, said of the closing. While one can get Chicago-style dogs at a number of places, Larosh noted the variety of Hot Doug's offerings, including duck fat fries which, she said, were "pretty choice." Plantan, 29, said he had heard about the closing "and I just felt 'well, I gotta go.'" Carrie Hardin, 31, showed up with her 2-year-old son, Fred Mann. "It's the kind of place that makes you glad you live in a city like Chicago," said Hardin, a North Center resident. Read more about "The 'Man Behind Hot Doug's" here.